Here are some facts about Joan of Arc, the French farm girl who led the French army to victories against the English in the Hundred Years’ War. Joan of Arc was born in about 1412 in Domrermy in the duchy of Bar (later to be the province of Lorraine) in north-east France. Her father, Jacque d’Arc, was a farmer and village official. When she was about twelve years old, Joan started to experience visions. She believed that she was being visited by Saint Michael, Saint Catherine and Saint Margaret. The saints told her that she must defeat the English and have the Dauphin, Charles, crowned in Reims as the King of France. When she was sixteen years old, Joan started to act upon her visions. She attempted to persuade Robert de Baudricourt, a garrison commander, to give her permission to visit the Royal Court at Chinon. He refused her request to being with, but changed his mind when Joan successfully predicted the French defeat in the Battle of the Herrings, part of the Siege of Orleans. Disguised as a man, Joan travelled to the Royal Court and managed to secure a meeting with Charles. He was impressed by her story and agreed to send her to Orleans with his mother-in-law. Joan dressed as knight. 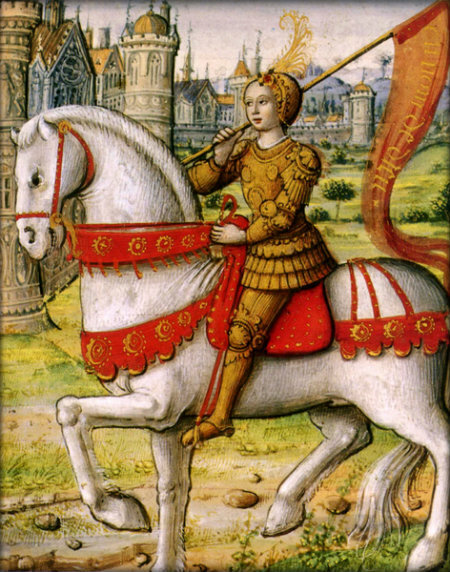 Joan of Arc reached Orleans on 29th April 1429. Jean d’Orleans was in charge of the army at this point and although he allowed Joan to attend some of the war council meetings, to begin with he didn’t always agree with her ideas and strategies. Joan wanted the French army to be more aggressive. Joan’s presence had an immediate impact on the French army. On 4th May the French captured the Saint Loup fortress and on 7th May they successfully attacked les Tourelles, a key English base, leading to victory at Orleans. Following the victory at Orleans, Joan was given co-command of the French army, along with the Duke of Alencon. They recovered Jargeau, Meung-sur-Loire and Beaugency from the English on mid-June, before defeating an English army in the Battle of Patay. The French army moved towards Reims on 29th June. They forced the Burgundian forces (allies of the English) in Auxerre to surrender on 3rd July and Troyes was captured after a four-day siege. On 16th July the French captured Reims, and the coronation of Charles VII took place. The French army lead by Joan of Arc attacked Paris on 8th September, but was forced to withdraw. Joan of Arc was captured on 23rd May 1430 during fighting at Compiegne. She was held by Duke Philip of Burgundy until he sold her to the English. Joan of Arc was tried for heresy in 1431. There were many inconsistencies and legal problems with her trial. Although heresy wasn’t a capital offence (wasn’t punishable by death), a repeat offence of heresy was. Joan of Arc was found guilty of repeated heresy and she was executed by burning on 31st May 1431. She was about 19. Joan’s trial was overturned and her innocence was declared officially in 1456. She was made a Saint of the Roman Catholic Church in 1920. Joan of Arc has become an important French national symbol. During World War 2 her image was used by both the Vichy Regime, who emphasised her aggression towards the English, and the French Resistance, who emphasised how she fought against an invading and occupying force. Hundreds of books, films, poems and plays have been produced about the story Joan of Arc. Joan couldn’t read or write. She dictated all of her letters. Some modern historians believe that Joan’s ‘visions’ were caused by epilepsy, schizophrenia or bovine (cattle) tuberculosis. The extent of Joan’s leadership has been questioned by some historians. Although it is clear that she contributed to strategy and directed troops, she tended to keep her distance from the front lines of fighting. Joan was wounded twice. First on the shoulder by an arrow from a longbow during the Orleans fighting, and then on the thigh by a crossbow bolt during the attack of Paris. Many people believe that Joan was burned at the stake for taking part in witchcraft. This was not the case (see above). She was actually convicted of being a ‘relapsed heretic’ (wearing male clothing after having signed a document confessing to having done this in the past and promising to change her ways).